Find below details on how to grow marigold plants in containers from seeds, flowers and cuttings. 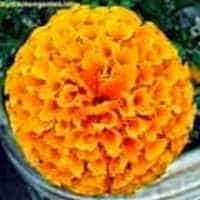 Also know the complete information on marigold flowers including types, varieties, pictures, flower colors, growing instructions and care tips. Marigold is a herbaceous plant, meaning it has thin stems without much wood and it grows fast, even in pots and produces flowers in a short period of time, adding color to the garden. Marigolds are beautiful, strong fragrant flowers that are seen most commonly in the gardens. These are very easy to grow annual plants, which are widely grown throughout the world. The marigold flowers are bright yellow, orange and gold in color, representing passion, optimism and success. These flowers are associated with the sun, the warmth of the rising sun. The red marigold color represents prosperity and a long life. All types of marigold have the same meaning. The Scientific name of marigold is Calendula officinalis of Calenduleae family. The name marigold is similar to Mary's gold, a plant native to Europe, Calendula officinalis. In India it is called as Genda Phool (गेंदा, गेंदे का फूल) and Sayapatri Phool (सयपत्री) in Nepal, means hundred-leafed flower, referring to its many florets per head. The other names of marigold are Caltha, Gols bloom, Gold bloom, Holligold, Marybud, etc. The flowers are used in making garlands and bracelets (mala and gajra) and in India, the marigold flowers known as Genda Phool are offered to Gods in temples and for decoration in weddings and festivals. The marigold is a powerful insect repelling plant. Marigolds, specially the Mexican marigold can keep away bugs, beetles, thrips, hornworms, whiteflies and wild rabbits. However, marigolds attracts spider mites and snails. Squirrels and chickens love marigold flowers. It is said that chickens who eat marigolds lay eggs with bright yellow yolks. The marigold Calendula officinalis flowers is used for many treatments in the form of healing herbal ointments, teas and tinctures. My garden displays orange and yellow marigolds from summer to almost winter, providing a colorful display of flowers. I am growing these flowers for many years now, they are very easy to take care of without any problems. Marigolds are annual plants and come in different sizes and colors, yellow and orange being the most common (look at the marigold pictures). Marigold plant is not a perennial plant, but they grow for several months. The marigolds are self-seeding annuals, they will grow again in the next season if the dead blooms drop on the ground. Tagetes erecta (African or American Marigolds): These marigolds are tall, erect-growing plants, grow to three to five feet in height producing large globe-shaped yellow or orange flowers, up to 5 inches diameter. This variety takes longer to produce flowers than the French type. Tagetes patula (French Marigolds): These marigolds grow 5 to 18 inches tall producing small red, orange, yellow or red - orange striped bicolor flowers of size up to 2 inch diameter. Tagetes tenuifolia (Signet Marigolds): The signet Marigolds produce single-flowered marigold grow up to 12 inch high, producing small richly colored yellow to orange colored edible flowers. The flowers can be used in salads, pasta and other dishes to get a lemony flavor. Triploid hybrids (Mule Marigolds): These marigolds are the hybrids of African and French marigolds. They grow from 12 to 18 inches high. This type of marigolds are unable to produce seed, so they also know as mule marigolds. Of all the marigold varieties, French marigolds and African marigolds are widely cultivated. Marigolds do not need much care once they are established and produce a display of colorful blooms in your garden for long time. Follow the following tips to get your marigolds bloom for several months. It just takes about 6-8 weeks to flower after you plant the seeds. Marigolds love lot of sunshine, so plant them in full sun. Partial sun is also good. Marigolds in shades can have an adverse effect on flowering. Marigolds are not fussy about soil, but grow well in moderately fertile well-drained soil. Mix cow manure or compost and some river sand in the soil and mix well. Growing marigolds in pots is quite easy. Marigolds are easily propagated from seeds. You can buy marigold seed or seedlings from the garden shop. Alternatively, you can pluck a mature flower from your friend's garden and start the plant as mentioned below. How to plant marigold seeds: The first step for growing marigolds from seed is to sow the seeds. Sow the seeds directly in the soil in Spring. I start seeds in a seed growing tray or small pot at the end of spring. Just sprinkle the seeds and cover with a thin layer of soil and water well. Do not sow the marigold seeds too deep, cover the seeds lightly with soil. The marigold seeds should not be planted more than 1 cm deep. If sowing with a dead flower, just chop off the leaves and open the bottom pod and spread it in the pot and cover with soil and water. Place in a warm place and keep damp. In cooler places, cover the tray with a plastic wrap and place it in a warm spot, such as the top of the refrigerator. Marigold seeds will germinate in 1-2 weeks. Once the marigold seedlings appear, remove the plastic wrap and move the tray in a bright place. Marigold seedlings are easy to handle. Separate seedlings when they are about 2 inches tall and plant them in beds or pots. Space tall marigolds 1 to 2 feet apart and lower height type about half to one foot apart. Slugs and snails love these small seedlings, they will eat up all of the seedlings if not taken care of. Put some mulch around the seedlings so that they cannot reach to them. I usually cover the seedlings with small pots during night. Use a 2 inch layer of organic material such as sugarcane mulch on the soil around the stem of the plant. This helps to retain moisture in the soil. Mulching also protects the young tiny plants from slugs, snails, grasshoppers and frost. If planted in pots, marigold plants need daily watering, but do not need regular watering if growing in ground. Water the plants deeply until the water comes out of the drainage hole. Allow the soil to dry between watering. Do not sprinkle water on the flowers and foliage. Always water the plants in the morning so that the water fallen on the foliage can dry up. Marigolds do not require fertilizers if planted in a rich soil. I generally feed my marigolds with a liquid fertilizer high in potassium. Excess fertilizing will encourage increased growth of foliage but less number of flowers. No pruning is needed for marigold plants. You only need to remove dead flowers to encourage blooming. Actually they will bloom more profusely if you remove the dead flowers frequently. I put a small stick and tie the stem by a soft polythene to protect the plant from strong winds. For taller variety of marigolds, staking is essential. Marigolds are relatively free of problems of insects and diseases. In very hot weather, spider mites, bacterial leaf spot, powdery mildew, leaf spot and root rot can be problem. I never had any problem with my 25-30 marigold plants in pots which I plant each year. It is easy to collect marigold seeds and preserve them for using in the next season. Let the flowers remain on the stem so that they fully mature and begin to dry. Harvest the flowers when the petals get dried and the base (the lower part of the flower) is turning brown but still green. Remove leaves and open the pods, take out the seeds and save in a ziploc bag, store in a dry place. Preserve the seeds for the next year. Marigolds bloom 1 month after sowing. You can increase the number of marigold flowers and the length of blooming period by regularly removing the spent blossoms. When the marigold season is over or the plants die, you can cut back the marigolds to the ground and clean the soil. Sometimes, you may have healthy marigold plants, but no or very few flowers. The main reason for this is the absence of sun light the plant receives. The marigold plant will produce foliage but few blooms if planted in shade. Also feeding your marigold plant with a fertilizer high in nitrogen will produce lot of foliage and less blooms.